A fabulous Spring pesto that does not pretend to be the regular basil Parmesan one- fresh peas and watercress and some basil (of course!) make for a divine burst of flavour in the mouth. Serve with any salad or pasta dish. 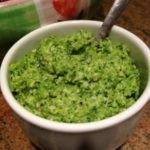 Make the pesto by pulsing the hemp seeds, peas, garlic and a few generous pinches of salt and pepper in a food processor. Add the watercress and basil and pulse again then add the lemon juice and Dijon mustard. While the processor is running, drizzle in the olive oil. For a thinner pesto, add more olive oil until it reaches your desired consistency. Taste and adjust seasonings. Chill until ready to use.